The mind can sometimes be a secret theatre where a monologue between thoughts, experiences, culture, history, and everything in-between is created. My work has always been a way for me to interpret that monologue that goes on between my thoughts and the different cultures that I have experienced and absorbed through out my life so far. For the past nine years, I have traveled to Honduras, Central America, where I have interacted with people that live in a harsh poverty. However, instead of being filled with bitterness, jealousy or malice, the people and families I have encountered are gentle and kind hearted, giving way to a tenderness that I rarely encounter elsewhere. 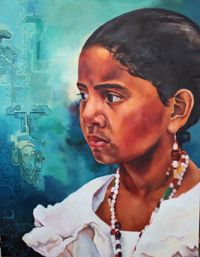 My paintings recreate the beauty I experience in all different cultures with the combination of elements of Honduran history, vibrant colors, portraits of Honduran women I have interacted with, and at times portraits of myself.